Picture: Arial photo. Hole #3 on left. Hole #4 on right. From the tee decks (at the top of the photo, outlined by stones), one must drive over the larger pond and place the ball between the smaller pond and the tree line shown in the bottom left of the photo. A 150 yard second shot remains to an elevated green , protected by a U shaped bunker guarding the front and left side of the green. A dog leg left, the landing area is shown on the right side of the photo. 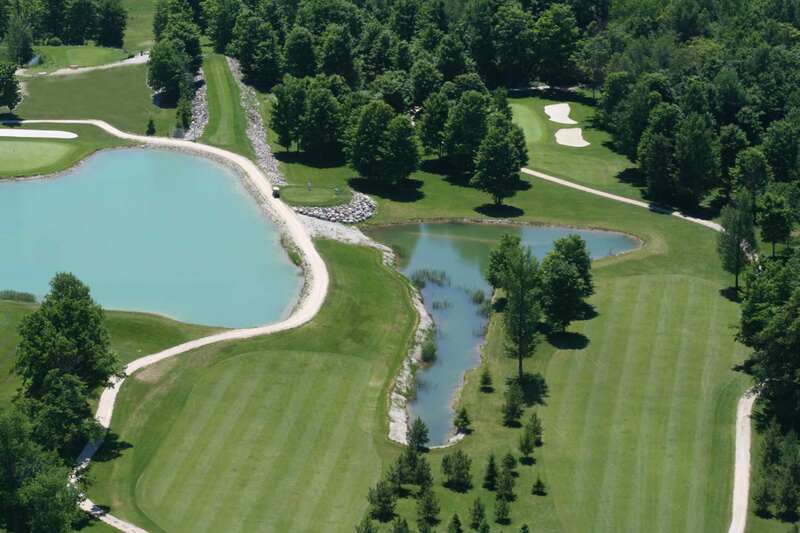 Errant drives will find the smaller pond or the large maple trees guarding the right side of the fairway. Two large bunkers protect the right side of the green. A line of trees running from the landing area along the left side of the green must be avoided.